At least 20 civilians were killed Sunday in Syrian regime attacks in Eastern Ghouta, a suburb of Damascus, said a civil defense organization based in the area. Dozens of others were injured in the attacks which targeted opposition-held areas of Arbin, Beit Sava, Misraba, and Hammuriya, according to the White Helmets. Officially known as Syria Civil Defense, the White Helmets is a volunteer organization that operates in moderate opposition-held parts of the war-stricken country. Eastern Ghouta falls within a network of de-escalation zones -- endorsed by Turkey, Russia and Iran -- in which acts of aggression are expressly forbidden. 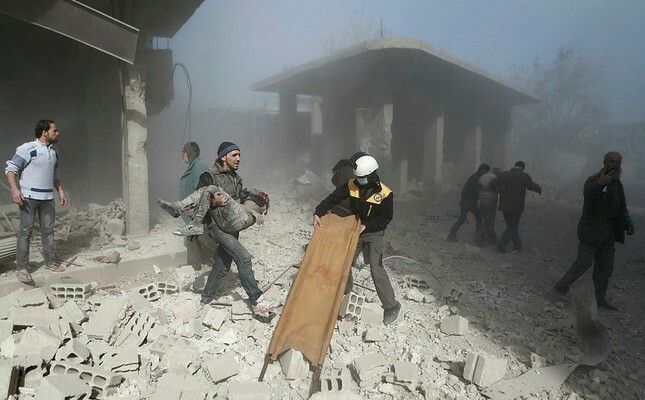 Nevertheless, regime forces have maintained their attacks on the district, leaving dozens of civilians dead or injured. According to local civil defense sources, at least 160 civilians have been killed by regime forces in the area in the period from Nov. 14 to Dec. 3. Syria has only just begun to emerge from a devastating civil war that began in early 2011 when the Assad regime cracked down on pro-democracy protests with unexpected ferocity. Since then, hundreds of thousands of people have been killed in the fighting and more than 10 million displaced, according to the UN.